It wasn’t pretty at times, but Chelsea won’t care. Another three points in the bag courtesy of a Diego Costa goal sends Chelsea back to the top, and their form is looking ominous for their title rivals. This wasn’t a comfortable match in any way, shape, or form. To date, no one has quite worked out how to play against Antonio Conte’s 3-4-3, but if anyone could find a way to keep Chelsea’s firepower at bay, it would be a West Bromwich Albion side led by manager Tony Pulis. Until the 75th minute, it looked as if Pulis might succeed in his mission. 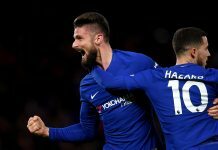 Opting for a calculated press and his wide players tucking in, West Brom frustrated Chelsea by defending with six against Chelsea’s attacking five. hen it was Salomon Rondon’s turn to drag a shot wide after the striker muscled David Luiz off the ball before bearing down on Thibault Courtois. As Chelsea’s 3-4-3 struggled to create chances, Conte decided to switch things around a go to a back four on the hour, introducing Willian for Pedro and sending Cesar Azpilicueta to right back. That tactical change almost backfired when the Baggies created their best chance of the match. Rondon, who led the line expertly, barreled down the left side of the penalty area, but Darren Fletcher couldn’t quite reach his pass under pressure from Gary Cahill. 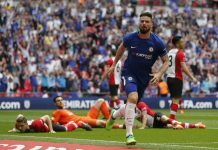 Crying out for creativity, Cesc Fabregas came on for the quiet Victor Moses, and it was his hopeful poke forward down the left appeared to be dealt with by Gareth McAuley. Costa, who had been chasing lost causes all match, muscled the defender out of the way, before charging into the area and unleashing a vicious, rising shot to beat Ben Foster at his far post. 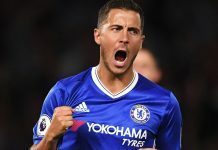 With the Baggies’ resistance broken, Conte again showed his tactical acumen, restoring the back three by withdrawing a relatively quiet Eden Hazard for Branislav Ivanovic to see out the match with ease.